This article discusses the challenges that space microelectronics circuits have to face, evaluating the latest trends and developments and especially focusing on reprogrammable circuits. Space electronics is a field of R&D that few people have heard about or had experience with, still it could be interesting to everyone with a minimum of electronics knowledge to get some insight into this field. Historically considered, space electronics has been a major driving force for the development of electronics. It was the development of rockets and missiles during the cold war that led to the first mass production of integrated circuits. Today the situation has however been turned upside-down: Electronical components have found their way into all kinds of consumer articles, and there are just a few electronics producers who have specialized in the little niche that space missions have become. A considerable technology gap has therefore evolved between the capabilities of space components compared to those of commercial components. Space electronics is subject to very harsh environmental conditions. First of all, the electronics must survive the vibrations imposed when the rocket is launched. Secondly, it has to be able to withstand very high temperature variations. Due to the vacuum in space, there is no thermal convection or conduction taking place, with the only heat transfer mechanism remaining being radiation. A satellite orbiting the earth therefore experiences that the temperature varies from more than 120 Degrees Celsius on the side facing the sun to less than 150 Minus Degrees Celsius on the shadow side of the satellite (out in the cold, interstellar space, the radiated temperature goes as low as 2.7 Kelvin, given by the background radiation). As air cooling is not possible on a satellite, the satellite instruments have to be designed in such a way that the heat is led away to a place on the shadow side where it can radiate out in the cold space. Outgassing is another issue that has to be taken care of. As space instruments normally are placed as payloads on a satellite together with other instruments, it is not acceptable that the components are releasing vapors and thus interfering with the measurements of other instruments, for example by depositing material on optical components. Space qualified components therefore have to be manufactured using ceramic materials – plastic packages are normally not usable. 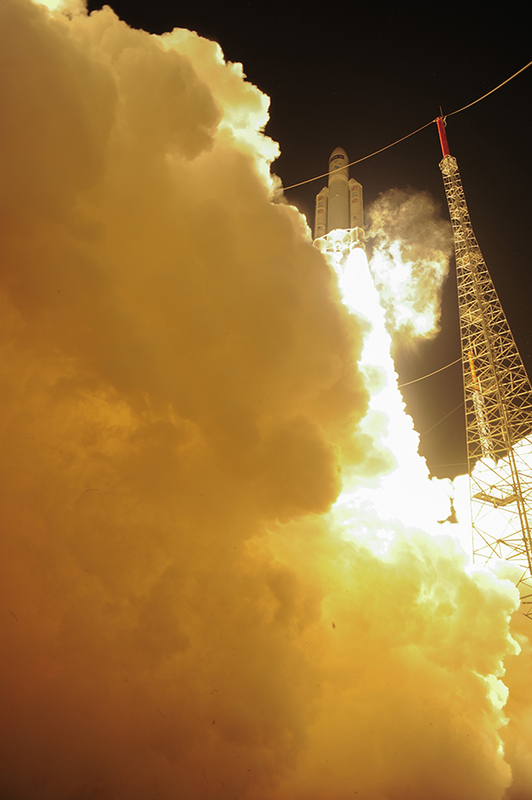 Space electronics meets many of the same challenges as the electronics used in offshore installations, like the requirement to withstand very high temperatures. However, in space there are also requirements to meet that we do not see so many other places: For example, the electronics has to withstand much higher levels of radiation than on earth. In space, there are many sources of radiation. With the solar wind comes both electrons, protons and heavy ions. In addition, there are protons and heavy ions coming from galactic, cosmic radiation. When these particles approach the earth, they are captured by the earth magnetic field, and as a consequence electrons and protons get trapped in radiation belts called the Van Allen belts (the heavy ions are also being deflected by the magnetosphere, but due to their higher energy, only a few of them are actually getting trapped in the radiation belts). For satellites in geosynchronous orbit, the radiation belts are causing significant problems for the electronics. Regarding the satellite electronics, there are two ways that the radiation can do harm, either with so-called Single Event Effects (SEE) or with the Total Ionizing Dose (TID). Single Event Effects are, like the name implies, effects cause by one single energetic particle. While the Total Ionizing Dose is a measure of how much radiation the electronics circuits have accumulated over its lifetime. The reason that the radiation finally destroys the circuits is the following: A particle going through a transistor generates electron-hole pairs in the thermal oxide used in the integrated transistors. While the generated electrons have a high mobility and therefore quickly find their way out of the oxide, many of the generated holes get trapped in the oxide traps that always are present due to impurities. The more the circuit is irradiated, the more traps are being filled up with holes, shifting the threshold voltage until the transistor has been permanently switched on or off. Regarding the single event effects, one normally distinguishes between three different types of effects: Single Event Effects, Single Event Latchup, and Single Event Burnout. • Single Event Upsets (SEU) are defined by NASA as “radiation-induced errors in microelectronic circuits caused when charged particles lose energy by ionizing the medium through which they pass, leaving behind wake of electron-hole pairs.” SEU does not destroy the circuit, but it corrupts the information in registers and memory elements. But SEU does not have to be harmful as long as one has strategies to meet these effects. To get rid of a SEU, it is sufficient to reset or reprogram the affected memory elements. • Single Event Latchup is a condition that can occur when charged particles are injected into the substrate material of integrated circuits. They way these integrated circuits are built up (MOS-technology, with their corresponding parasitic, bipolar structures) may cause these charges to enter into a positive feedback loop where more and more current is dragged through the substrate. If there are no mechanisms built in to turn off the power supply in time, the current may simply continue to increase until the entire circuit breaks down thermally. The dangers of latchup were earlier a major obstacle to the development of CMOS based technology. As the dimensions of integrated circuits get smaller, the probability of SEU gets higher, since less and less charge is required to reduce the voltage levels in a memory node. For TID, the opposite is true: The smaller the process, the thinner the gate oxide, and the fewer becomes the number of holes that can be trapped in impure states. The process technological development therefore makes it more and more easy to manufacture electronics that can handle high radiation doses, while it becomes more and more important to have good strategies for handling the single event upsets. To shield against radiation, one can either try to shield the entire electronics box or one can use so-called Rad-Pak technology, developed by Maxwell, where the shielding is built into the package of the individual integrated circuit. Shielding gives good protection against particles from solar flares, but have little effect against highenergetic, cosmic radiation. Similarly, shielding can most of all be used to reduce the total ionizing dose (TID). Against single-event effects, it is less useful. This is related to the stopping power of charged particles (dE/dx): When the particle is slowed down by the shielding, it loses energy. But the lower the energy the particle has left when it has broken through the shielding, the less area it needs to depose the remaining energy. Therefore the danger of single event effects increases in the regions in the circuit that are affected. The European Space Agency, ESA, sets strict requirements to components which are to be flown on an ESA financed expedition. The components should not only be produced in a particular way, they always have to be tested in accordance to very strict standards in order to become qualified for space, and this leads to space components having a cost that is much higher than the commercial one. For example, it can cost thousands of dollars to obtain one single, space qualified clock crystal, while the off-the-shelf commercial crystals can be bought individually for 30 NKR each. The difference is that the space qualified crystal needs its own production line, including months of testing after it was produced, and with traceability throughout the entire process. However, for many components, the packaging and test procedures are the only things distinguishing normal components from space-qualified components. For use in the qualification process, ESA has defined its own set of standards, called European Cooperation for Space Standardization, ECSS. ECSS has three main branches: project management standards, construction standards and quality ensurance standards. It is therefore not only electronics that has to be designed, one even has to «design» a large variety of documents aimed at verifying that both the project and the product meet all relevant requirements. The strict ESA system is well-suited for private enterprises which have the infrastructure established to handle orders in this way, but for public research institutions, this can lead to a lot of additional paperwork. Many public research institutions have therefore taken the consequence and outsourced the technical/administrative part of their experiments to private enterprises. Normal soldering tin has until recently been a composition of 63% tin and 37 % lead (eutectic tin). However, the European Union came with an environmental directive, called Reduction of Hazardous Substances (RoHS), that became active from 1st of July 2006. From this date, it has been forbidden to use lead in soldering. Lead-free solder tin has a higher melting point than eutectic tin, and the components to be soldered lead-free therefore need to withstand higher temperature. But there is even one more problem with lead-free solder tin: It is called whiskers. Whiskers are electrically conductive crystal structures made of tin which sometimes grow out of metal surfaces. They can grow many millimeters and therefore short-circuit conducting wires. Whiskers grow faster in vacuum than in air, and satellite systems worth millions have been destroyed due to this phenomenon. It is only pure tin that produces whiskers, and one should therefore be safe with eutectic tin. Until now, the space electronics industry has been allowed to keep using lead-tin alloys for their instruments. However, the ban on lead in the consumer electronics industry has become an increasing obstacle for the space electronics too. The consumer electronics industry has replaced the tin-lead alloys with lead-free tin all over their production line, and there are not many producers that provide a complementary set of tin-lead based components for use in the space segment. Reprocessing the components with eutectic tin is a possible solution to this problem. 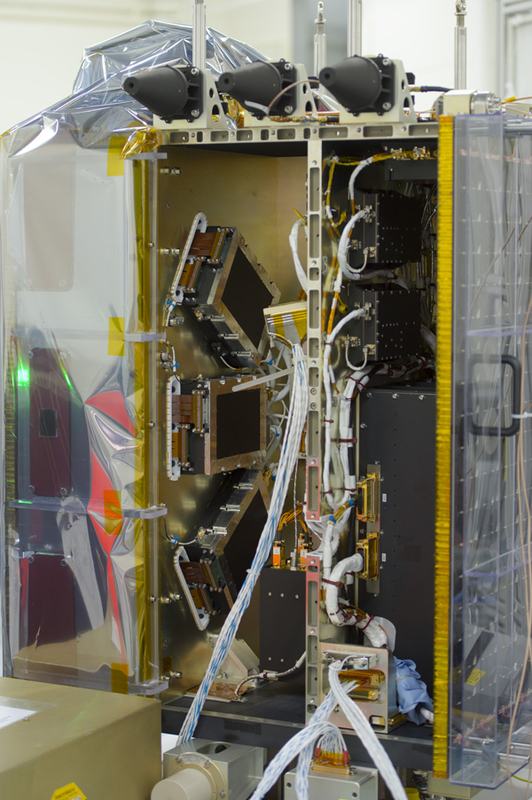 Flexibility has always been a keyword when it comes to electronics designs, and it is not less important in space application where the design is locked once the satellite is launched. At the same time, it should be clear that the fewer components that are used in an instrument, the less the probability to introduces sources of failure. Programmable, integrated circuits, collecting as many functions as possible on the same chip, therefore give major advances. Such circuits are called FPGA’s (Field Programmable Gate Arrays). FPGA circuits were originally not so much used in space, as most of them are RAM based and therefore not sufficiently radiation hard due to the single event upsets. But the first FPGA circuits that were developed used antifuse technology, instead of configuration memory, to provide connections, and these circuits proved to be radiation hard. The American enterprise Microsemi (formerly Actel) has specialized on manufacturing such circuits for the space segment. The TID required to qualify a component as “radiation hard” or “radiation tolerant” varies from manufacturer to manufacturer. Some manufacturers set a limit of 100kRad to classify their component as radiation hard. Other manufacturers set even higher limits for their “radiation hard products”. For example the antifuse based Microsemi RTAX has a TID of 300kRad, classifying as “radiation tolerant”. The TID required for a component used in an aerospace instrument depends entirely on the space mission itself, like choice of orbit and duration of the mission. For example, an instrument in polar orbit is exposed to less than 50kRad during 10 years, so a TID below 100kRad are in many cases acceptable. A safe choice would be to only pick conservative technologies able to withstand hundreds of kilorads. However, by taking the actual radiation environment into consideration, one would in many cases have freedom to pick technologies which normally are excluded due to their lower TID. Antifuse circuits have the disadvantage that they can only be programmed once, and the FPGA architecture is therefore locked during the space mission. To keep the functional flexibility, an FPGA solution with an embedded microprocessor is a sound solution. Quick and simple functions can be built directly into the FPGA firmware, while more complicated control and regulation algorithms may be put on an external Flash ROM and run on the embedded processor. By using the Flash ROM for storing the software, one has the advantage that the system can be reprogrammed directly in orbit from the ground station. The LEON3 processor is 32-bit SPARC compliant embedded microprocessor, developed particularly for space missions and used especially on ESA funded missions. It is available as synthesizable source code for a variety of different FPGA circuits, including the RTAX. Although one does not want more components than necessary, one does not want any “single points of failure” either. On the contrary, it is often desired to build in redundancy, i.e. two or more modules serving the same function, to obtain a system that is fault tolerant. Triple Modular Redundancy (TMR) is a classical example of this: Instead of driving a signal with one single driver, one uses three. If one of the drivers is malfunctioning, for example due to single event upsets caused by radiation, the two other drivers force the third one back into the right phase. TMR is an approach where the electronics building blocks themselves are made radiation hard. Another approach is to try solving the problem on a higher, logical level. For example, the software can build redundant, cyclical codes (CRC) into its data. Such codes preserve the digitized information even if one or more bits have changed value. The Microsemi RTAX is an example of a circuit that uses both techniques to obtain radiation hardness. Ordinary logical elements like registers are protected with TMR while memory elements like RAM can be protected with error correcting codes where bit failures can be detected and corrected automatically by hardware. The last ten years there have been significant achievements in radiation hardening FPGA technologies based on Flash and SRAM. Today, Microsemi does not only provide antifuse based FPGA’s for space, but also Flash based FPGA’s. And now even Xilinx provide SRAM based FPGA’s which are commercially available for the space segment, their state of the art designs being the Xilinx Virtex-4VQ and Virtex-5VQ. The reason that the Flash-based FPGA’s have become radiation tolerant, is partly due to improved processing technology. The thinner the silicon oxide, the fewer holes get trapped in the oxide when a particle passes through, and hence, the higher becomes the Total Ionizing Dose. The RT ProAsic3 FPGA from Microsemi has been found to remain functional after 100kRad, and can therefore be considered radiation hard. More impressive, however, are the advances made for SRAM based FPGA’s. The advantage of SRAM based FPGA’s is not only that they are reprogrammable, contrary to the antifuse based circuits. They even have a much high logic density than their flash based counterparts, and therefore they can house much larger and more complex digital designs. As long as the single event upsets remained an unsolved problem, the SRAM based FPGA’s were a technology that could not be counted on at all in the space segment. In an SRAM based FPGA, single event upsets do not only corrupt data, they can destroy the entire configuration – and therefore the functionality – of the circuit. Xilinx has come far in addressing these problems, using a variety of sophisticated techniques, on both logical as well as transistor level. On the logical level, TMR is used to protect flip-flops against bit failures. At the same time, the configuration memory is constantly being rewritten, even during the normal operation of the FPGA. The technique is called scrubbing. The scrubbing can be used for both partially or full reconfiguration. When running partial reconfiguration, CRC codes are used to detect failures, and the parts of the configuration memory that contain failures are overwritten with correct configuration data. The correct configuration data is loaded from a radiation hardened Flash memory. On the transistor level, Virtex-4VQ and Virtex-5VQ take advantage of an SRAM structure which is a bit different from the ordinary one. While an ordinary SRAM cell is comprised of six transistors, the radiation hardened structure uses 12 transistors, with all the 12 transistors interlocking with each others. This construction makes it much more difficult for a charged particle to flip the polarity of the entire cell, and it has dramatically reduced the probability of a single event upset. When it comes to the total ionizing dose, the results are at least as good for the Xilinx circuits as they were for the Microsemi RTAX. Xilinx 4VQ has a TID of 300kRad, the same as for Microsemi RTAX, while the Xilinx 5VQ can withstand even a TID of 1MRad. Microelectronic circuits for space have to meet requirements which are very different from those of ordinary consumer electronics, one of the most particular is the requirement to withstand radiation. The driving force of electronics development today is the consumer electronics, while space electronics developers prefer solution that are already proven safe and reliable. Considering the choice of components and practical circuit solutions for the space segment, one could say that the space electronics lags behind the consumer electronics with approximately 10-15 years. In the latest 10 years, we have seen that the reduced dimensions have made normal microelectronics circuits more robust to withstand higher and higher radiation doses, increasing their TID. At the same time, new techniques at both logical and transistor level has made it possible to handle a much higher flux of single event upsets. These advances in technology and techniques has made it possible to pass on from antifuse-based FPGA designs to large and reprogrammable SRAM-based FPGA designs. The last decade we have therefore seen a development within microelectronics for space that is similar to the one already seen within ordinary consumer electronics.